Apple does not want to support Flash on iOS platform (yes, iPhone, iPad and iPod touch cannot playback Flash media) as it argues that the emerging web standards, HTML5, which can do everything Flash offered will eventually replace Flash technology. And now who needs a tightly controlled App Store when a similar web app built on HTML5 can do the job? Many eBook stores has gone the way of HTML5 web app to response and circumvent Apple’s new in-app purchase or in-app subscription rules which disallow any links to external mechanisms or stores for purchasng digital books or magazine subscriptions. As the result, most publishers altered to apps to strip the links or stores inside the app, and goes on to introduce HTML5 web app, where it’s not required to be submitted to iTunes App Store to be approved, allowing more controls – such as a store or buy button. Amazon has also launched its Kindle Cloud Reader, a web app that lets user to browser and read the Kindle books instantly, plus make purchases from Amazon from within the app. 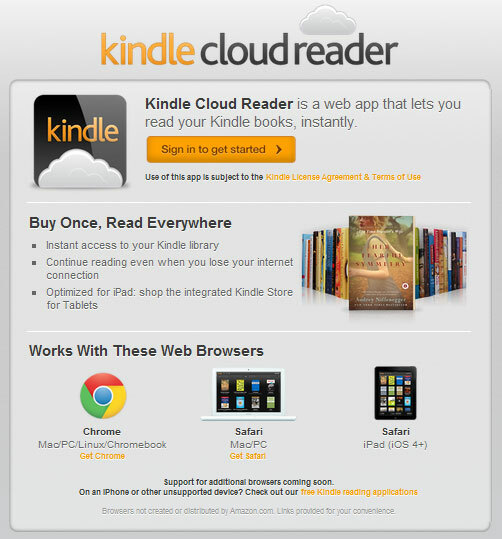 Kindle Cloud Reader was optimized to be used on Google Chrome web browser running on Mac, PC, Linux or Chromebook, Safari web browser running on Mac or PC, and Mobile Safari on iPad (iOS 4+). Kindle Cloud Reader is available as an extra avenue to access the Kindle library, which already have native apps that support almost every platforms available, including iOS, Android, Blackberry, Windows Phone, PC, Mac, and etc. Kindle Cloud Reader uses the HTML5 caching feature that allocates 50MB of storage to store downloaded e-Books for offline reading, and to remember the last read point in the book. However, unlike native apps, users of Kindle Cloud Reader cannot make any notes in the texts currently. On iOS device, just tap on the Menu button and select “Add to Home Screen” to create an icon to the web app for faster access.